We’ve been building professional websites that serve as the hub of any online presence in the Santa Rosa area since 2005. Our expertise includes WordPress, Ecommerce and full custom sites that get noticed by your customers and the major search engines. We provide a wide range of internet marketing services that enhance your brand and bring more visitors to your site. Services include SEO, email marketing, social media, digital advertising, blogging help and more. Boost your business today! We take pride in our work and are continually evolving our process to keep up with rapidly changing web design technologies. All our designs are mobile friendly providing a great user experience for all visitors. Check out a sample of our latest work! 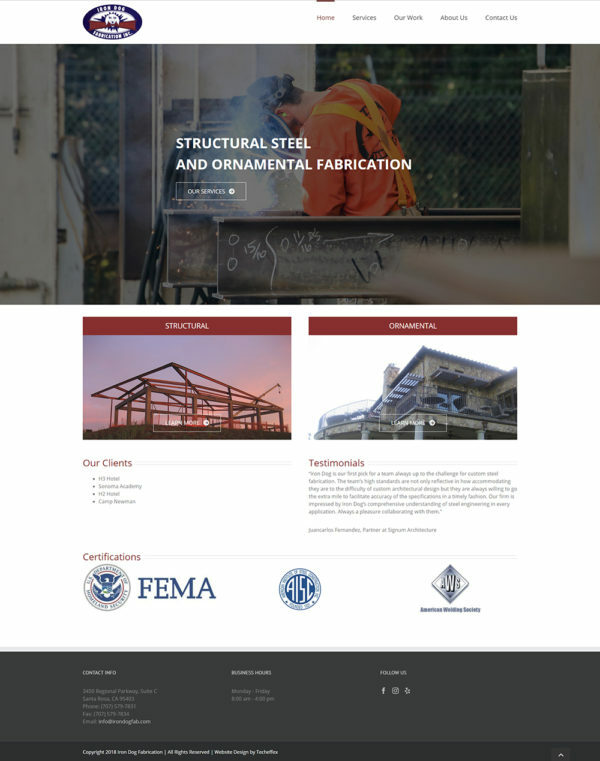 Iron Dog Fabrication provides ornamental and structural steel fabrication services to the San Francisco Bay Area. Iron Dog wanted an updated website that better showed their work in a more mobile friendly website. In addition, we moved Iron Dog off their older more expensive hosting solution to our own hosting services saving hundreds of dollars on annual hosting fees. We stay on top of the ever changing trends in web design and internet marketing so you don’t have to. All of our websites are responsive and mobile friendly so you’re covered on mobile platforms. We have years of software engineering experience and guarantee our work for life. We take the time to explain everything so there are no mysteries or surprises. We’re here when you need us, before and after the job is complete. Our pricing is very competitive and won’t break the budget. Mike created the website for my business after I spent a year struggling with another website that was not as professionally done and simply did not present the image and information that I wanted my business to present. Mike was very quick to respond to his phone and email during the design process. My business website is more complicated than many, but nothing I wanted was beyond Mike’s ability. He really knows what he is doing. Mike took the time to understand what I was trying to accomplish and then explained to me how I could accomplish those goals in more efficient ways than I had imagined. He was able to steer me away from mistakes I would have made without his expert advice. in the end, he saved me a lot of time and money. Now my business is growing faster than ever. I wish I had started with him in the first place. Not sure how we stumbled on Mike, but my husband I are so glad we did. We have used Mike for about 5 years or more helping us seniors with technical problems, and guidance on a web page that had been done by our daughter for our B & B style/vacation rental. We just recently had Mike design a brand new web site, and a mobile site. We could not be happier with what he created, and his many helpful hints. He is the man. He is very patient, kind, knowledgeable, very easy to work with, reasonable on his fees, always a phone call away or a email away. Oh, and we get wonderful compliments on our web page. HIGHLY RECOMMENDED. I would give 10 stars if I could.